Improving the accuracy of scent detection is one of the most important aims for APOPO’s TB-detection rats. APOPO’s Research & Development (R&D) team recently embarked on the development of an alternative procedure, using an operant conditioning chamber to train the HeroRATs. APOPO researches TB detection rats as a “failsafe” - examining clinic tested human sputum samples delivered from partner clinics in Tanzania, Mozambique and Ethiopia. Any rat-suspect samples are rechecked using WHO endorsed methods and if TB is confirmed, APOPO notifies the clinic. In the current setup, a rat performs a nose poke response (holding its snout into the hole above the sputum sample) for both TB-positive and TB-negative samples. The only subtle difference is the duration of this behavior: a rat signals that it has detected tuberculosis by keeping its snout in the hole for a certain length of time (e.g. 3 seconds) but sniffs for a shorter amount of time if the sample is TB-negative. With this new experiment we try to separate the response of the rats for negative and positive samples more distinctly. Operant conditioning chambers are commonly used to study animal learning and behavior. The chamber was initially created by the psychologist B.F. Skinner, as a variation of Edward Thorndike’s puzzle box which was used to perform learning experiments in rats and pigeons. The operant chamber allows an animal to perform a certain action, like pressing a lever, in response to specific stimuli, like odors or lights. The lever-pressing action can then be associated with the delivery of a delicious food reward for operant conditioning. 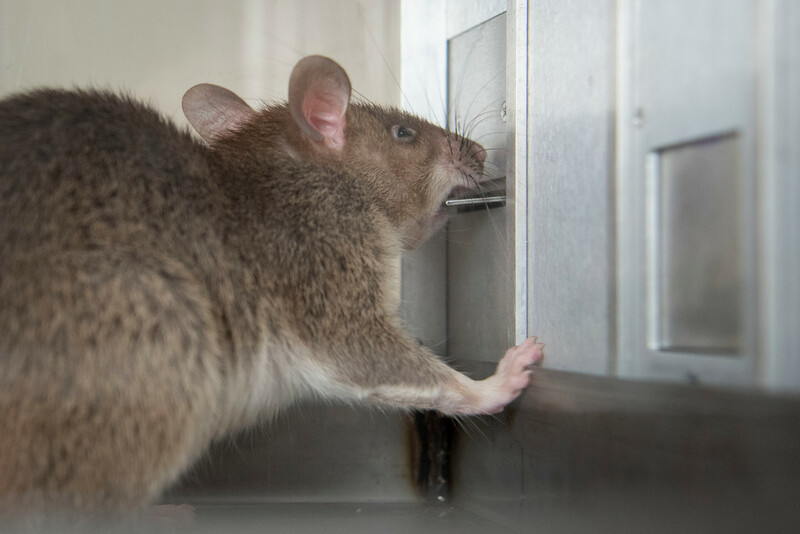 APOPO’s R&D team is currently establishing a new training procedure where rats will learn to press one of two retractable levers on either side of a door, behind which different odors can be presented. First, the rats will be trained to sniff the odor when the door opens. After the rat has sniffed, the door closes, and the levers become available. Next, our clever rats have to make a choice: if they sniffed a target odor, they will press one lever, and if they sniffed a non-target odor, they will press the other lever. Having two choices (lever 1 or lever 2) may encourage the rats to be more precise in their odor discrimination, and also provide more detail about a rat’s certainty that an odor either is or is not a target. Four rats: Iceberg, Myron, Kalani and Nysa are mastering the final training stages of this difficult task, and the next step will be adding other odors for olfactory discrimination. Although this task is more complicated than the simple nose poke used by the TB detection rats until now it may provide more precise information while also reducing ambiguity. APOPO sincerely thanks its partners and donors for making this R&D project possible.